A well-functioning sewage treatment plant (STP) achieves two things – (1) it handles solid and liquid waste, which otherwise would pollute the earth, and enables its recycling (2) it is a source of usable water (effluent) and fertiliser (sludge). Unfortunately, the STP at Yelahanka New Town 5th Phase, achieves neither. Built by the BWSSB about 10 years ago, spread across 5 acres of land, the STP was supposed to treat about 3MLD. The treated water was to be let into Yelahanka Puttenahalli Lake. However, despite huge investment, the STP has never been operated to treat sewage. Instead, the “Waste Water Pumping Station” is used as a buffer, to pump about 1MLD to the Yelahanka Tertiary Sewage Plant. Residents in the area claim that the pumps are usually not operational and sewage is being let into the lake without any treatment. On 30th March 2014, while inspecting the Yelahanka Lakes, Upa Lokayukta Justice SB Majage also visited the defunct STP. Yelahanka residents, including members of the Yelahanka Puttenahalli Lake and Bird Conservation Trust (YPLBCT), a citizens’ group that is working to save Puttenahalli Lake, discussed the problems posed by the non-functional STP. Senior officials of BWSSB, Lake Development Authority (LDA) / Forest Department, environmentalists Dr Harish Bhat and Dr S Subramanya were also present. After listening to the officials, the Upa Lokayukta directed BWSSB to submit a plan for the revival of the STP by 21st May 2014. While at Puttenahalli Lake, the Upa Lokayukta inspected the sewage entry points. Apart from the STP, sewage had been entering from Doddaballapur side. 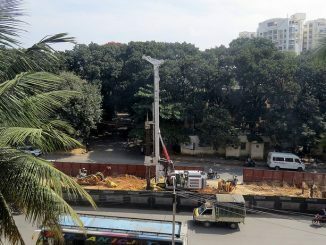 Residents noted that this had been stopped but instead of directing it to the STP, it was now being diverted into the Rajakaluve (main storm water drain) leading to another lake, Yelahanka Lake. The other sewage inflow, from a broken sewage line in Yelahanka 4th Phase, was still continuing, directly into the lake. BWSSB is yet to take action. CEO of LDA, Mr Shivanna, indicated that that tenders for the preparation of DPR of the lake had already been called for. The DPR would be based on a bio-diversity model. He suggested that the lake activists get involved during the preparation of the DPR, so that their expertise could be utilised. Chief Conservator of Forests, Mr Ajay Misra was keen that the lake area be declared as a bird reserve. Contrary to this though, were recent pictures taken by YPLBCT trustees that showed the felling of trees abutting the lake, by the Forest Department. Further action could be expected after the general elections were over. I bet they may not follow the 21st May deadline fixed by Hon’ble Upa Lokayukta citing again election duty/model code of conduct or tender formalities and also a few showers of rain, Apart from Doddaballapur sewage water, New Town sewage water, the sewage water of big apartments surrounding these lakes may also be entering these lakes and the BWSSB engineers inaction are to be investigated.! The precious natures gift of water body and natural resource spoiled due to ineffective and corrupt system of governance! We are not managing the water supply and distribution properly. Morethan 40% unaccounted water distribution by BWSSB, most borewells dried up, open wells polluted due to seepage or blockage of sewage pipelines, etc! Well done Arthi for yr active reporting. I support you. I donot know why the Hon’ble Upalokayuktha to kindly take suo motto action under his powers for allowing sewage water entering the lake. All our Bwssb engineers, officiers, forest officers, lake dev. authority officials know as to how the rain water and sewage water to flow and sewage water not to enter the lake and pollute. Several crores of amount spent on civil work to preserve the lake and water. Has everything gone n the DRAIN?